When you're ready to create a new survey just click the green New Survey button in the header at the top of any page. After clicking it, a dialog box will appear with some initial options that will help you get started. 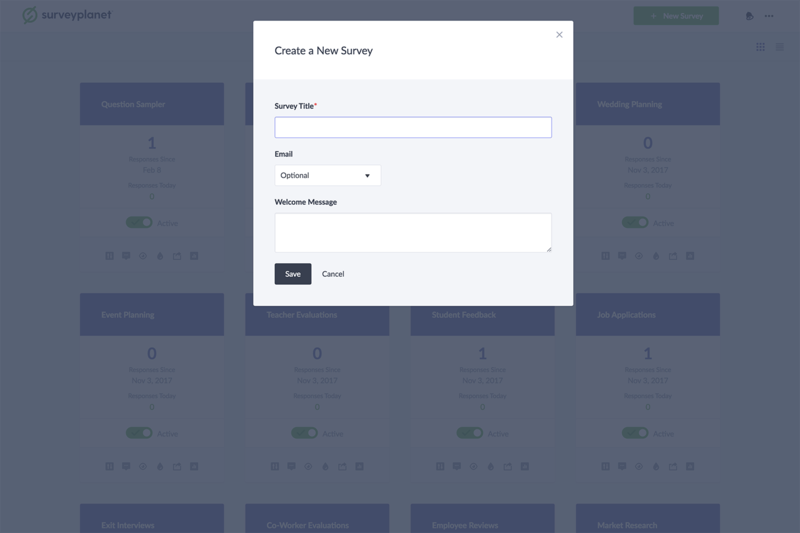 The Create a New Survey dialog box is where you add key information about your survey including the Survey Title (required), whether you would like an email address for the survey participant to be optional, required, or not asked for at all, and an optional welcome message to begin your survey. The Survey Title is what will show up at the top of every page of your survey. Optional: Ask for it, but it is still optional. Required: Ask for it and make it required. None: Do not ask for it at all. If you ask for an email address, SurveyPlanet will check to make sure that the text entered is in an actual email format: e.g. name@domain.com. You can add an optional welcome message to the beginning of your survey. It is often helpful to add extra information for your survey participants about the survey: how long it should take or any other extra instructions you would like for them to have before they begin.